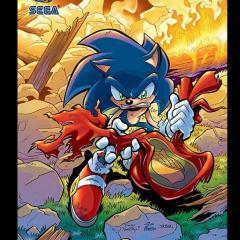 Sonic #280 still has a while to get released, mostly because #279 still hasn't been physically released. Yes, that issue is already on the site, but that's because Archie did briefly release the digital version on time (November 2015). However, it (and Universe #82) were quickly removed for some reason, and both were delayed to January 2016. From what I've heard, though, this can be a common thing with comic books. Annoying? Oh, yes indeed! But I just thought I'd clear that up for everyone curious. Hopefully, things will get back on track by March/April. Oh, and also, I'm saying this for the mods, The delay is on Archie's side and not on Scanf, as soon as SCANF gets a physical copy, it'll be on SCANF. So please don't be mad people. And yet, sadly, I have a feeling that it's not the last delay. I really hope the person who said this isn't the last of the delays is wrong. I'm really worried about what's going on at archie and I know they won't tell us and if Ian does it will be the last thing he does as a sonic writer. These issues is the mighty no.9 of comics if you know what I mean. It's a game that was supposed to be released mid-February, the true successor to Mega Man, but it got delayed for stupid reasons, like bugs in online mode, so they delayed the whole game even though it could easily be released as a temporary singleplayer only. is it just me or are the comics getting delayed evey month.